NEW ORLEANS – The status quo held firm atop all of the regions in the first Division I Regional Cross Country Rankings of the regular season, released Monday by the U.S. Track & Field and Cross Country Coaches Association (USTFCCCA), but not without some shuffling behind the top-ranked teams. 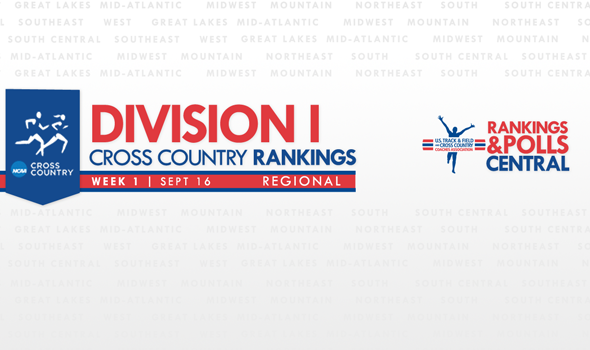 While there weren’t any changes at the very top, both the women’s West Region and the men’s Great Lakes Region start the week with new teams at No. 2 in Arizona and Notre Dame, respectively. The Arizona women swapped spots with Washington — which learned this week of a season-ending injury to top runner Megan Goethals — in a move that will likely be reflected in tomorrow’s National Coaches Poll. Washington was the national preseason No. 5, while Arizona, which earned a team title at NAU last weekend, came in at No. 7. The Notre Dame men also traded places with Indiana in the Great Lakes Region as part of chain of rankings re-arrangements that saw six of the top eight squads move around. Elsewhere around the country, the Rice men and Providence men used strong early season showings to jump to No. 3 in their respective South Central and Northeast regions. Rice defeated a number of Regional rivals at its home Rice Invitational this weekend to jump up three spots in the rankings, while Providence emerged victorious in a head-to-head match-up with No. 18 Columbia to vault up two spots and past the Lions to No. 3. A pair of women’s teams were also able to climb to No. 3 in their regions in BYU (Mountain) and Florida (South). The Cougars edged out conference rival Portland and No. 24 Weber State for the team title at the Autumn Classic in Provo, Utah, this weekend, while Florida was third at its Mountain Dew Invitational this weekend without its full complement of runners. Regional Championships will be held Friday, November 15. More details can be found at Regional Championships Central.